Good morning! It is mornings like this that I thought of our home in Kota Kinabalu. How about waking everyday to see the beautiful Mt. Kinabalu and a peaceful sea with grandeur boats from your bedroom window? That's the experience that the Pacific Sutera Hotel has brought us during our 3 days, 2 nights stay in Kota Kinabalu. Pacific Sutera Hotel has been our home, or should I say, sleeping quarter (as we made the most of our time exploring Kota Kinabalu) that we just come back to the hotel to change clothes and sleep. You know how they say you should not get a good hotel when traveling? Because you will end up choosing to stay in a hotel than go out - and staying in a hotel such as Pacific Sutera, you have all the reasons to stay (I will tell why in the coming posts..). After a safe and almost festive flight from Manila to Kota Kinabalu care of Zest Air Flight Z2 501, we were welcome by Philip in the Kota Kinabalu International Airport. Philip had been our tourist guide for the 3-day familiarization trip to Kota Kinabalu. He's the most awesome and funniest tourist guide I ever encountered. He has so much stories to tell. 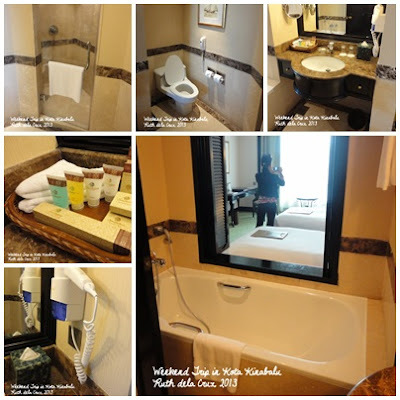 Click Read More to see how beautiful our hotel is! This is our official bus for the familiarization tour! Riding the bus from the airport to the hotel, Philip made an announcement - he said there was a change of plans and change of hotels. Days before the trip, I was anticipating that we would stay in a backpacker's hotel lodging. I have never experienced staying in such kind of hotel. But when I saw the itinerary, it was noted that we would stay in a standard hotel. Then, I was hearing Philip from the loud speaker and announcing something - we would be staying in a 5-star hotel! A resort hotel! As he announced the big change, we were passing right in front of the beautiful Sutera Harbour Hotel. I suddenly imagined myself enjoying a pina colada, while looking at the beautiful sunset from the pool. Before my dreams could even bring me to the lala-land.. we were asked to take our luggage and get off the bus. The hotel is just a good 10 minute drive from the international airport. How convenient! Out hotel, Pacific Sutera Hotel is part of the Sutera Harbor Resort, which is housed in a 384 acre land. It got its own resort, golf course, spa, marina and a country club. A total of 956 rooms including the Magellan Sutera which makes the place perfect for families, business travelers, honey-mooners, explorers, and soul-searchers. The place is perfect venue for weddings and pre-nup pictorials too. If I would conduct a business meeting, I would bring my client here, as the ambiance would easily make him say yes to the deal. We were welcomed by this.. It should have been a busy hour in a hotel, but the place is a reflection of relaxation and peace. The interior of the hotel spells grandeur with its high ceilings, lovely staircases and posts. It is as if I stepped in a hotel in Europe, but the orchids and interior plants remind me of the Malay ethnicity. The team did know how to make the most of the time. While we were waiting for our rooms, we were escorted to the Cafe Boleh to have lunch. It was my first time in Malaysia, and my first time to try authentic Malaysian food in Malaysia soil. Cafe Boleh is a 24-hour restaurant in Pacific Sutera Hotel. Guests have the option to dine in indoor or in the al-fresco overlooking the sea. I am just not certain if the boleh in Cafe Boleh means the same as that of their battlecry, Malaysia Boleh, Malaysia, Can Do It! One thing I know, I can do their buffet! I can do it all over again! Aside from Cafe Boleh, guests can also visit the other restaurants and bars in the Pacific Sutera Hotel. 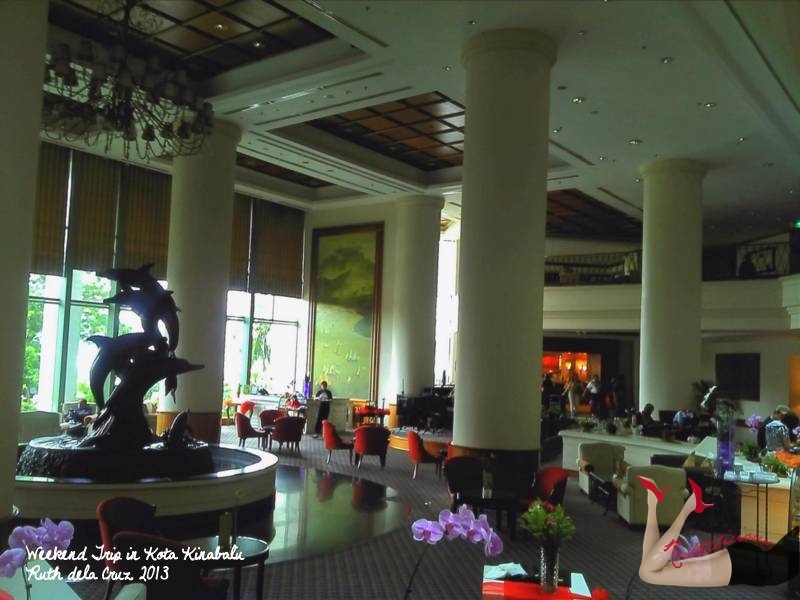 Check out the Silk Garden, Waves Pool Bar, Lobby Lounge, and Jugs Bar. I was so excited to try all the food, that I chose to put down my camera and indulge. They serve all kinds of dishes - seafood, meat, chicken and veggies. I tried their curry as if it was my first time to taste a curry dish - surprisingly, it is more aromatic and flavourful. Probably because they use more spices which are readily available in the market, as compared to the usual curry powder that we use in the Philippines. Mayang Ismail, Director of Marketing Communications asked me how I find the food - and I am pleasantly surprised. She took pride as she said they used different spices for the food to make the dishes more flavourful. I love the Fresh Roasted Vegetables, the cherry tomatoes in particular. The Braised Mussles with Kam Jeong Sauce is also good - but I chose not too eat too much, because seafood is not very friendly to my tummy. And speaking of friendly, the staff of the Pacific Sutera Hotel, including their General Manager, Sir Stefan Willimann even personally welcomed us to the hotel. I felt so little representing my blog. There is nothing sweeter than feeling like you have relatives in Sabah, Malaysia awaiting for your arrival. Thank you to the Sutera Harbour Team - Sir Stefan (General Manager), Mayang (Director of Marketing Communications), Ryazilah Abdul Rahim (Marketing Communications Executive), Tracy Lim and Clara Lim. The team is even nice to share with us the best places to visit and unique souvenirs we can bring home. 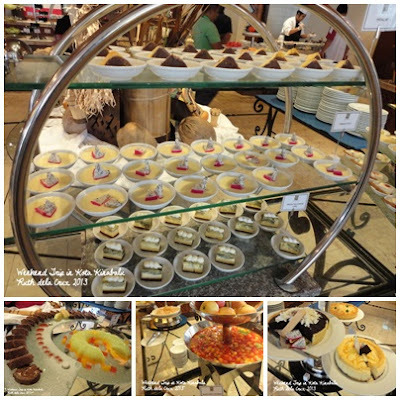 Their warmth welcome is even sweeter than the desserts that they are offering in Cafe Boleh. But I have to say, the Mango Cheesecake and the Chocolate Mousse are just divine. Spell pure chocolate ganache. We were literally shouting with disbelief at how good and divine the desserts were. People might thought we were going crazy, shouting at every bite of the cake. I so much enjoyed and indulged, that I totally forgotten to take pictures. Sue me. Just when you are feeling full, you immediately thought of lazing around the hotel room. We were assigned to a room in the 4th floor, and I shared room with Marjorie (www.livingmarjorney.com). This was really an exciting experience for me! I previously experienced traveling with co-workers, and people from different countries I never met, and now, I am exploring new places with blogger friends! As soon as we entered the Vhing Card, this what welcomed us! We actually had a little issue, our key cards were not activated... so we had to go down at the reception again. The clock was ticking and we only have 45 minutes to change, prepare and get ready for the start of adventure. You couldn't get mad at that moment, we just thought of it as part of the many surprises stored for us that day. while drowning yourself to a relaxing bubble bath! The other rooms that we have visited have the same design! The room has all the amenities needed by business and leisure travelers. Wifi Connectivity and LAN cable outlets available. to the hotel wifi from our room. I love the side reading lamps/lights! Each room has a TV set with local channels. Here's my favorite view while waiting at the elevator area..
And I just wrote about the room and our lunch, wait until you see what other interesting things Pacific Sutera Hotel is offering to its guests. Here's a teaser.. watch out for the upcoming posts. After we had taken pictures of the hotel room and we were left with a few minutes to prepare for the ultimate tour. We met up once again with Team Kota (that's how we call our group) at the hotel lobby, and off we boarded the bus to check out the museum, chocolate factory and visit the malls. Can't wait to hear the next stories? Watch out for the upcoming posts!